Children's eyes are unable to block as much UV radiation as adult's eyes, making children's eyes more susceptible to the damage caused by UV rays. The damage caused by UV rays is cumulative. 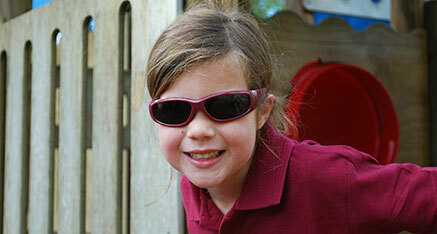 Wearing sunglasses from teen years or adulthood does not compensate for a lack of eye protection as a child. Research shows clear links that exposure to ultraviolet rays as a child predisposes to developing eye diseases including: cataracts, macular degeneration, pterygium, photokeratitis and skin cancer of the eyelid and eye area. 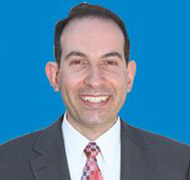 While Australian schools have come a long way in adopting sun safe policies, specific care and attention to children's eyes and adequate protection from the long term effects of ultraviolet rays remains a significant challenge. A broad-brimmed hat has been an integral part of primary school uniforms since the mid 90's, but only offers half the protection from UV rays, with sunglasses completing the final half of protection. Primary schools provide a learning environment for shaping positive health choices. This makes them the ideal setting for educating the next generation of the risks of UV rays and of how to limit exposure via sun- safe strategies, including wearing sunglasses. Schools have a duty of care to ensure that their sun-safe policies are up to date with current recommendations and research. 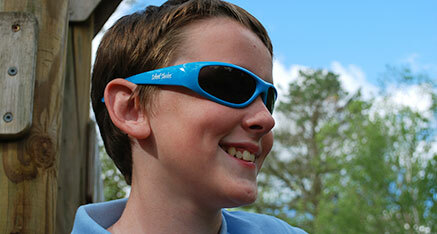 "Recent Australian studies have demonstrated that sun-related eye conditions start at a young age. Children as young as 8 years of age show permanent sun-related scarring on their eyes. Appropriately designed sunglasses do prevent this damage. Public health initiatives to protect children's eyes and encourage sunglasses usage are vital for good eye health within our community".